As much as I hate the question, “What is your favorite film?” I have, nevertheless, always had an answer, sort of by default. And, for the last seventeen or so years of my life, the answer to that tough, mind numbing question, has always been, and will continue to be, Bringing Up Baby, that zany film from 1938 starring Cary Grant as an uptight “normal” paleontologist on the verge of completing his brontosaurus, Katherine Hepburn as the ditsy socialite who continually bumps into said paleontologist, and directed with the kind of verve that only someone like Howard Hawks could muster. Recently, the Museum of the Moving Image in Queens, New York, screened the film in 35 mm as part of their long running Hawks retrospective series, with 2013 coincidentally marking the film’s 75th anniversary. When I found out it was being screened (probably two months ago), I knew I had to go. And I did. The film took me back, once again demonstrating why this film, above all others, impacted my life, for better and worse (mostly better), and was the starting point of my love affair with cinema. 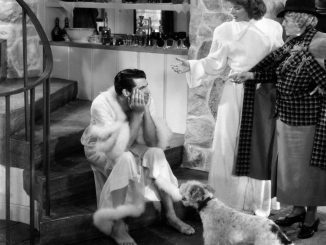 As someone who will never be very good with dates, the closest I can estimate is that I was two or three when I first saw Bringing Up Baby. For reasons unbeknownst to me, the first “film” my mother showed me was Hawks’ masterful screwball comedy, opting to not screen the Disney Renaissance work that is currently the fodder for my peers’ nostalgia. No, my mother showed me films like His Girl Friday (also by Hawks, of which I will mention later), Harvey, and To Be or Not to Be. Bringing Up Baby, though, is a film that I have constantly revisited, though, not only watching it once every few years, but at least once every month or so. Not unlike others’ ability to mouth the words to every line of dialogue to, say, Mean Girls or The Big Lebowski, I know every line from Bringing Up Baby by heart. But why should such a film, initially considered a flop and a continuing mark of part of Hepburn’s “box office poison” reputation, have such a huge impact on me? Moreover, how did it have an impact on me? With regards to my love of film, what else is there to say other than “I love it wholeheartedly”? I knew that there was something underneath the frenzied surface of the film, but I did not actively care. The film is almost too enjoyable and too skilled at sweeping its audience off of their feet in how splendid and full of life it is. Certainly, I can “turn my brain on” and find insight, passion, innuendo, and commentary in the film, and I have with various viewings, but every time I try to analyze the film, I stop. Hawks’ film is that enjoyable and lovely, a film so bent on pleasing the audience with its insanity, it’s a little less enjoyable if you try too hard to psychoanalyze its characters. I knew, though, that if I could find as much joy as I did watching, laughing, and (occasionally) analyzing such a film, I should be doing this regularly, maybe even for life. So, even at two or three, I knew I wanted to be a part of this world, where people got to experience life’s vigor, zest, and zeal on screen and write about how much it affected them. I wanted to write about film. Or you could argue that David is the crazy one, while everyone else around him, from the cop to Susan to Mr. Peabody is normal. David’s listless attempt to find balance in life makes sense both retrospectively and considering our modern world today. Everyone else in the film has, whether consciously or unconsciously, come to terms with the fact that life very rarely goes the way they want it to. Susan in particular has stopped fighting against it and started playing the system in her favor, using serendipity in her favor and her manic charm to get the man she wants. And, apparently, she can do this with any man in the film. She has Mr. Peabody, or “Boopy” as she likes to call him, “[wrapped] around [her] little finger”, she convinces the constable that she’s “Swingin’ Door Susie,” and, although he thinks her “crazy” at first, Dr. Fritz seems fairly charmed by her. If anything, Susan Vance, with all of her (inherited) affluence, and winning charisma, is in control of the world. 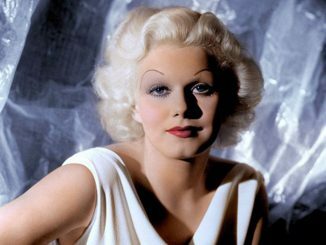 Behind the veneer of glamorous zaniness is heart, and that may be, first and foremost, what I love about the film. Although it was Hepburn’s only foray into straight screwball and slapstick, it is the earnestness with which both she and Grant play the characters. Would we feel bad for these characters if what they were doing, through their verbal and physical pratfalls, if we thought too hard about it? Maybe. But that may be part of the appeal. As they say, behind great comedy is great sadness, but what makes these characters so wonderful is that they all take themselves very seriously. 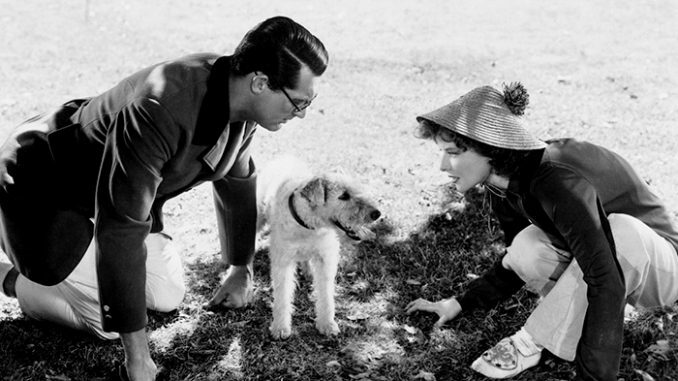 Hepburn has mentioned that Grant told her to play the character more seriously, as she had originally played it too much into the idea of it being a comedy. She said that the more she looked depressed when she fell, the funnier it was. (Schadenfreude! Catharsis!) We want Susan to win David over, and we cheer for her when she schemes, and it is unbearably heartening that she tries so hard to make David fall in love with her. And yet, nothing she does ever comes off as “desperate”. Even with lines like, “If I was engaged to you, I wouldn’t mind waiting, I’d wait forever”, it doesn’t sound desperate or even obsessive. It sounds determined. A friend told me that you’ve got to be smart to play dumb, and Susan always has something up her sleeves in a very sly, covert way. The film lacks the sexist notion that women, only through desperation, can win someone as straight laced as David is. How can I forget about the leopard, for whom the film is named? That most deliriously insane of MacGuffins, Baby is that bifurcated possibility of fear and desire, the perfect epitome of how David sees Susan: predator and seductress. He is fascinated and terrified of it, and I’m pretty sure that how’s most people thing of their respective romantic objects of desire: something to want and yet be scared of. The uses of the leopard, as a thing that exists in two and that plays slapstick along with the cast, is fun and highlights the film. That Baby is drawn to that jazz standard “I Can’t Give You Anything but Love, Baby”, is clever, and feels like a nod to human in general: however passive or aggressive we are, Love always serves as very strange, enigmatic comfort. Finally, there is, of course, the wonderful dialogue. 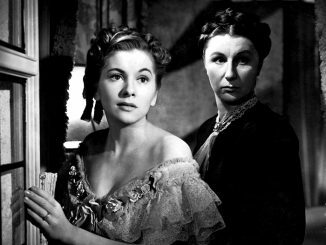 Sounding Hecht-ian with nearly every syllable, Nichols and Wilde’s lines are wild, clever, and subversive. (Miss Swallow: “You tried to put it in the tail yesterday and it didn’t fit.”) And, typical of Hawks, it’s all said with lightning speed. But nothing is lost this way. It does behoove the viewer to watch the film multiple times, but part of the fun is getting lost in the dialogue. Much like Hawks’ later, even noisier His Girl Friday, people talk over one another breathlessly, as if that, should they be unable to finish their thought, they will die. It’s hard to decide what’s funnier, though: the shouting, raving mad dialogue or watching David sit there, unable to get a word in edgewise. In such scenes, there’s a wonderful juxtaposition of the people who can’t shut up and the people who can’t speak up. I could go on and on about my adoration for the film, about how hilarious it is. Seeing it on the Big Screen was a beautiful moment, a culmination of all my effort I’ve put into learning about film, kind of like something coming full circle. In some ways, the film was finnier than it ever had been for me, and it was splendid experiencing it with an audience. There is an inherent nostalgia that connects me to this film as closely as others to, say, The Lion King. It’s special to me, a defining part of my life. I got to see Bringing Up Baby at the Museum of the Moving Image in Queens over the weekend in 35mm! So I wrote about how much the film means to me!